Writings on After Vasari bearing the new heading, “extra curricular” are attempts to explore this query in various ways, to probe the ever-nebulous boundaries of ‘art’ in hopes of grasping, however fleetingly, why it is that some endeavors and objects merit such a name. In The Brodmann Areas ballet from Norte Maar, dancers interact with video projection and sound by After Vasari’s own Paul D’Agostino. Science and art are, at times, uneasy bedfellows—one explores the concrete and measurable while the other incorporates our entire realm of possibility and fantasy. This was not always the case, of course. In Renaissance Florence painters were incorporated into the guild of physicians and pharmacists, emphasizing their skills in mixing and measuring pigments. Leonardo da Vinci became the essence of a ‘Renaissance man’ with his plans for a helicopter and anatomical sketches created alongside his painted masterpieces. His anatomical drawings, on exhibition at Buckingham Palace, were produced with near-photographic accuracy, capturing the nuances of how a spine supports the body and how the heart pumps blood. Dancers are often at the forefront of exploring the human body and its movements as a nexus of art and science. The Brodmann Areas, a recent collaborative ballet at Norte Maar, was named for a map exploring the cerebral cortex. Choreographer Julia Gleich introduced the final performance by sharing with the audience, “the dances are experiments.” And in that phrase, she summed up aspects of scientific experimentation that are driven by human creativity. Each piece danced was a meditation on kinesis and memory. 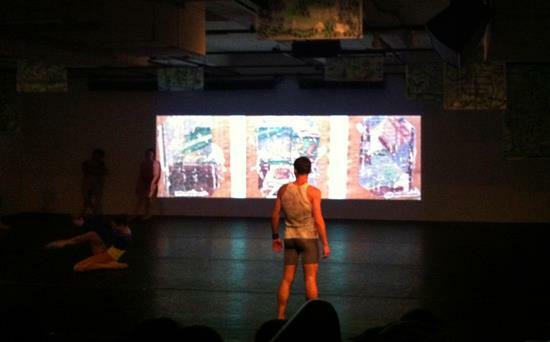 In a section called “Motivi esteriori e cosi via,” a film of collaged images was projected behind the dance floor. Each figure on the stage danced a response, emphasizing the temporal nature of fleeting images and the physical presence of the studio wall. As the images disappeared or changed, the movement continued, incorporating our memories of the images as an additional medium in the work. In a segment titled “Folium: a wrinkles on the surface of the cerebellum,” Jace Coronado danced a solo with a small ladder strapped to his back. His jubilant leaps were a manifestation of pure human achievement. The accompanying clack of castanets in Antonio Martin y Coll’s music referenced the flapping ladder. Stepping away from clinical references to the brain, the piece offered instead metaphors for subtlety, subconscious connections, repeated thoughts. The ballet was an ever-changing incorporation of dance, visual stimulation, music, and vocals that speak to the myriad connections and collaborations in the activity of the human brain. Harnessing neuroscience is also a way to decipher creative impulses. An Xiao of Hyperallergic has recently pondered the scientific impetus for art, exploring “what’s going on in artists’ brains” while they create. Jeremy Dean has pointed out that embodied metaphors such as “jog one’s memory,” can be put to literal use: movement, gesture, and even posture are connected to problem solving. But what about the inherent element of science that is creativity? Experiments, even when tightly controlled are the result of intellectual curiosity, of innovative problem solving. My response is to contemplate and challenge my own notions of medium and materials in the construction of art. Leonardo’s painstaking draughtsmanship was a vehicle for both scientific observation and visual expression; perhaps it offers the most tangible example of the human body as a loca sancta of both science and of art. 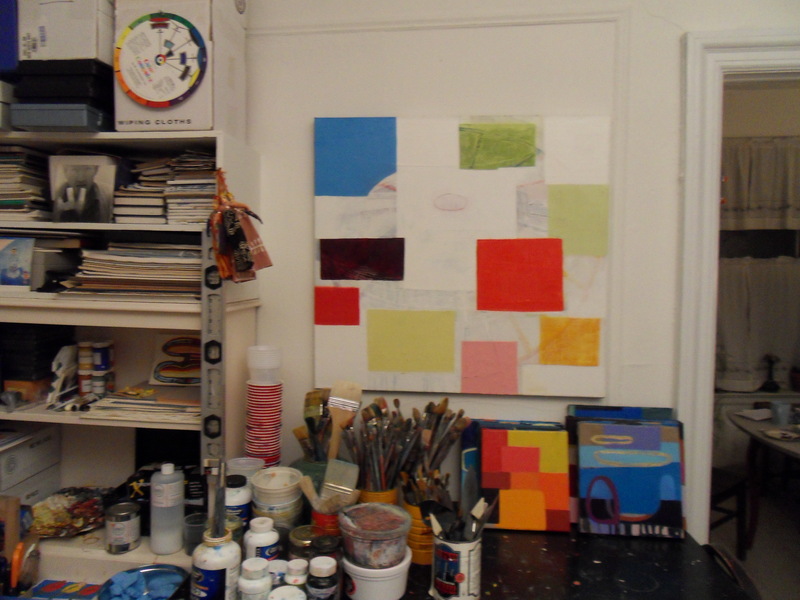 Cynthia Hartling's studio with a number of canvases including Blear-eyed (oil and gold leaf powder on linen). Cynthia Hartling is immersed in her art. Whereas more than a few Manhattan apartments have studios within, Hartling’s instead offers the distinct impression of a studio that happens to contain living space. Congenial and hospitable, she offered me snacks and tea, which I sipped amidst souvenirs of her travels and adventures, mementos of education and vacations, and most of all, canvases. 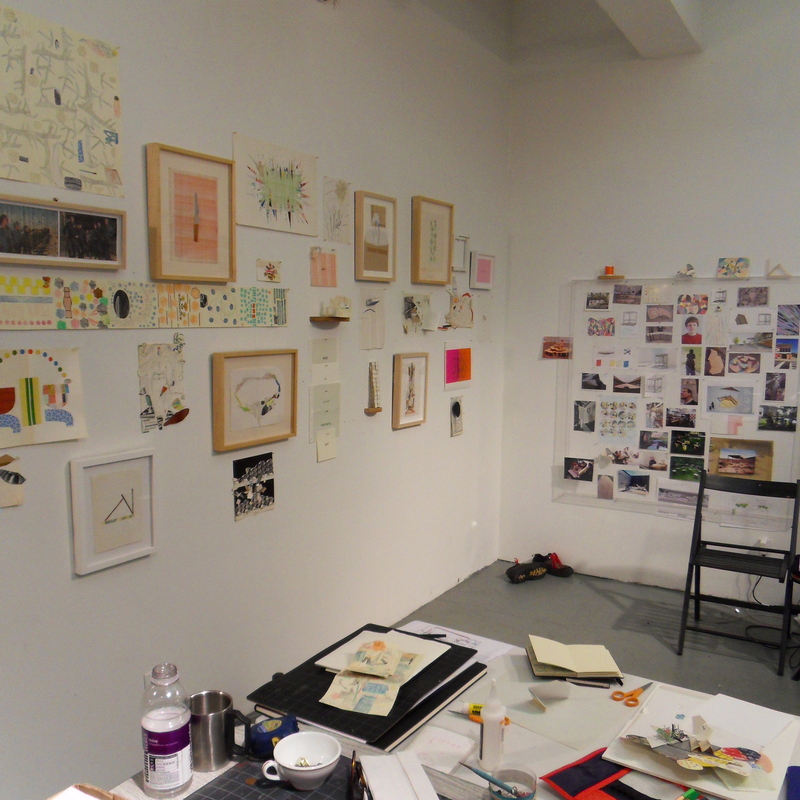 Filed neatly in corners and under tables and hanging on walls, examples of her work inhabit almost every room, bridging the gap between living and working spaces. Hartling told me that making art is an “essential component” of her life, that being separated from it can make a person anxious, but to make art is a way into understanding the world. The larger world is, indeed, embedded in the vivid geometric forms of Hartling’s oil paintings. She speaks of the Celts, of the 1960s and 70s in New York, of Native Americans and Europeans, of cave paintings and artifacts, although a viewer might not immediately perceive her abstract, aniconic compositions as carrying the weight of art history. But Hartling’s two-dimensional works actually offer nothing less than an alternative to linear perspective. The subject of Blear-eyed is, at a glance, dots. But when the artist referred to the shapes instead as “balls,” their connotation as objects in space became irrefutable. As such, they acknowledge a depth and an existence that goes beyond the surface of the canvas. It’s as though she has sculpted space out of a two-dimensional surface, bypassing the need for a vanishing point, figural narrative, or three-dimensionality. The surface is an active space. Oil paint is subtly sculpted on the canvas, raising the plane into the viewer’s space, bridging the gap between surface and viewer. Hartling has such a visceral and tactile reaction to color that her hand gestures become more articulated and pronounced when she talks about it. She has a deep affinity for color, for the richness and complexity it develops in relation to the canvas and to the emotions or expressions of the artist. In Blear-eyed, layers of melancholy blue-greys beneath sharply contrasting warm tones reveal raised paint and visible brushstrokes in currents of energy that require a close viewing. Details of Blear-eyed (left) and Now What (right) reveal the artist's textures and techniques. Larger pieces such as Now What enable a different kind of viewing. 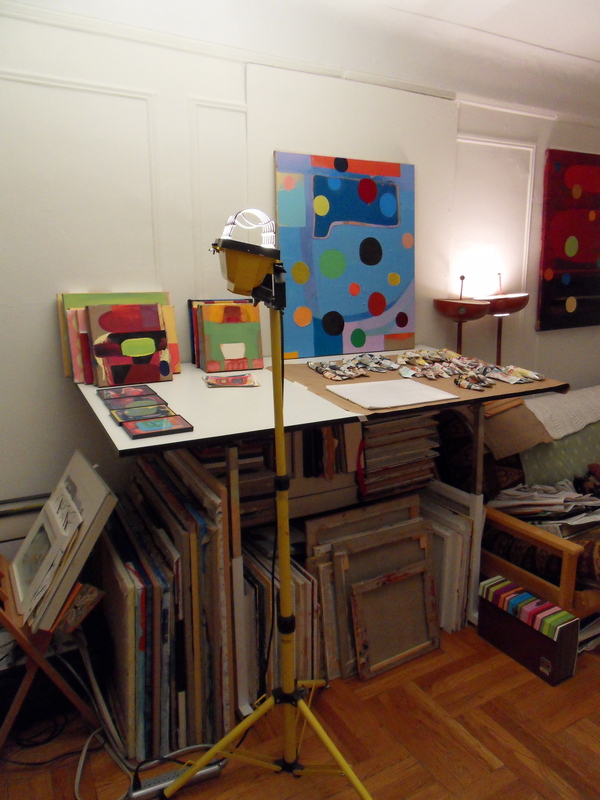 Immersion in the space is more immediate because of their larger-than-life size; I was able to stake out a small area to focus on the minutiae: texture, adherence of paint to linen, stray dots of paint. Regardless of their size, these paintings all dispel any notion of non-figural compositions as impersonal. The shapes themselves convey humanity. As opposed to Renaissance geometry, Hartling’s rectangles and circles are drawn without a compass, offering evidence of the artist’s hand; they feel unmechanical. Each layer of cracked pigment or splattered paint represents a motion, a human decision. Medicine Wheel (oil on linen) with smaller paintings and supplies. In abstract compositions, responses to human experience are often embedded as well. Medicine Wheel is imbued with a cosmological essence in the geometry and organization, with objects and moments layered upon one another and at the center, white on white. While I would not have guessed that it is the artist’s response to a white buckskin from a Native American ceremony, the painting does convey ritual organization and the electric excitement of experiencing something vivid and pure. By channeling a lifetime of travels and experiences into seemingly abstract works, Hartling demonstrates the truism that we are all products of our experience, and that allowing ourselves to be immersed in that experience is a way of making the creative process richer, more personal, and simultaneously more universal. 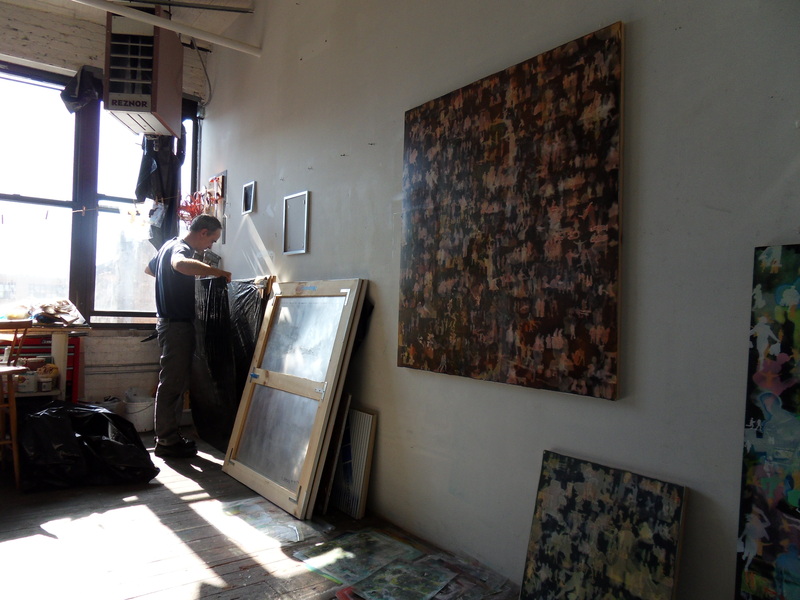 This studio visit took place on Thursday, November 10, 2011. 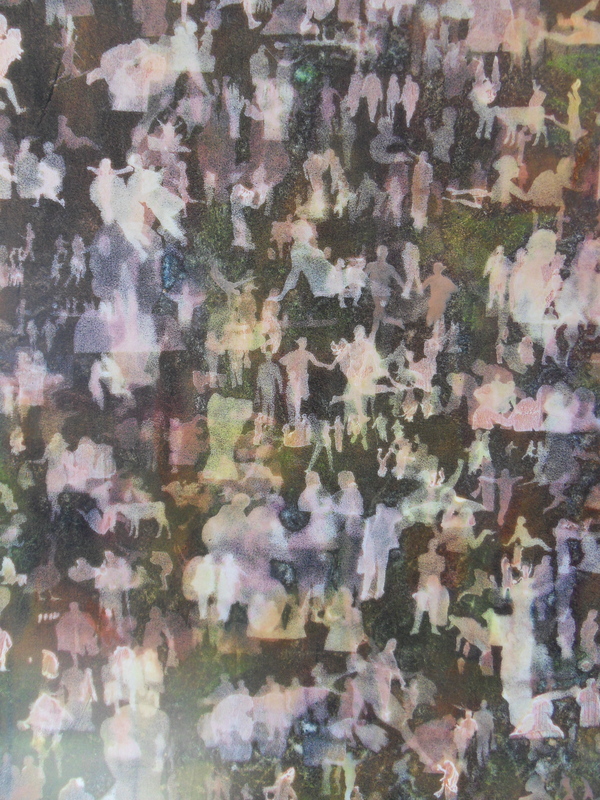 For a list of Cynthia Hartling’s current exhibitions and portfolio, visit http://www.cynthiahartling.com. 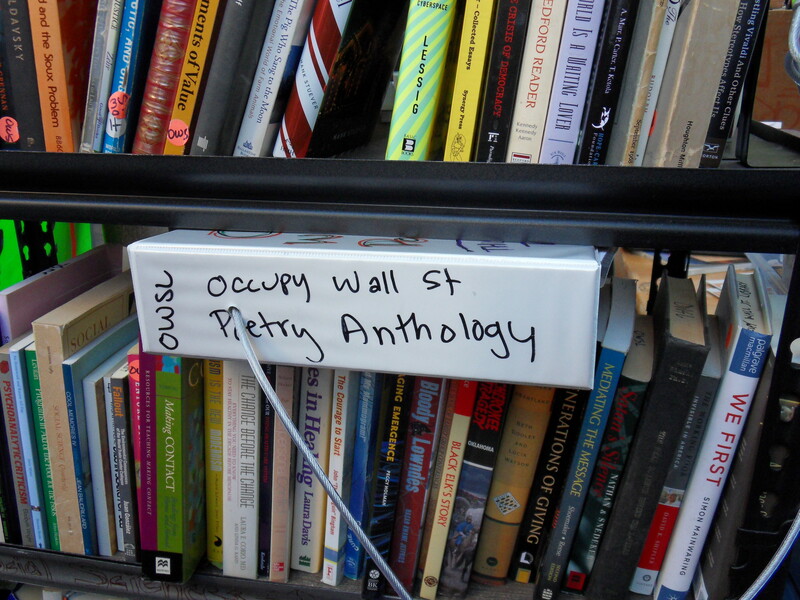 A binder containing the Occupy Wall Street Poetry Anthology rests on a shelf in the People's Library in Zuccotti Park on November 5, 2011. Alice Rawsthorn recently touted Occupy Wall Street’s design-savviness as demonstrated by its adaptable title and its use of the raised fist, the hash tag, and the oft-cited catch phrase, “We are the 99 percent.” Certainly one reason the movement has proliferated and engaged activists in many cities is its balance of versatile message and coherent identity. But under the larger umbrella of that overt message lie a thousand handmade signs, many with very individual and personal messages ranging from poignancy to conspiracy theory. These raise a set of questions: Where are the boundaries between art and design, between literature and text? At what point do communal messages become personal, or vice-versa? At what point does personal communication become art? 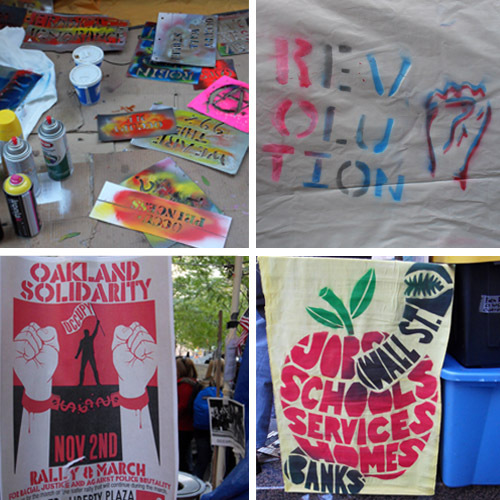 Stencils were a common tool for making signs to hang in and around the Occupy Wall Street encampment in Zuccotti Park. This essay was written for Centotto’s exhibition catalog that accompanied Marksmen and the Palimpsests, an interstizio exhibit by John Avelluto and Josh Willis that ran from November 5-December 17, 2010. Palimpsests, created through a process in which one substance scrapes away and then covers another, simultaneously revealing and concealing aspects of both, are as old as the earth itself. Geological palimpsests, for example, can occur when sediment deposited by a glacier comes in such strong contact with oceanic tides that the glacier loses its own properties.1 About fifty to sixty million years ago, in what would one day be labeled North America, pressure from the depths of the earth pushed magma through layers of sedimentary rock, forming vertical striations that were later eroded away, revealing an enormous bulge in the landscape now known as Devils Tower, Wyoming.2 This process of destruction and rebuilding is as gradual as it is revelatory; shifting tectonic plates, dripping stalactites and drifting sea floors all demonstrate eons of deposited and scraped-away moments. Every layer is evidence of the perennial life force and self-reflexive creativity of nature. Such effects manifest themselves in human existence as well, in the constant ebb and flow of urban development encroaching upon these geologically processed forms, in the urban landscapes of cities that grow in fits and starts, in cobblestone and concrete. Because making vellum was a costly and time consuming process, recycling of these precious sheets was a widespread practice. Countless manuscripts were washed or scraped of their original text and reused. In addition to financial and material practicalities, societal shifts also precipitated the creation of palimpsests. Texts that were deemed outdated were destroyed in favor of new ones that reflected current liturgical or legal information. Deciphering the content of these palimpsests offers scholars information about the shifting values in society and has even brought to light texts that were thought to be extinct. For instance, a lost section of Cicero’s late fourth- or early fifth-century De re publica was found beneath a seventh-century copy of Saint Augustine’s writings on the Psalms.4 Pagan Cicero had been subsumed by Christian Augustine on the page, a telling parallel to the political rise of the church over minority religions in the middle ages. Without doubt, Willis and Avelluto are not the first artists to intuit that even the most hidden layers of pigment or varnish imbue the art with a richer, more nuanced finish. It is pertinent, then, to note that Avelluto and Willis make no attempt to recover the sacrificed information in the layers of their own work or in their collaborations, as evidenced by Palimpsests, the collaborative series they produced for this exhibit. Instead, both artists are process-driven and utilize visual repetition and deconstruction, though to widely different effects. Willis’ work begins with introspection. Much of what he does adds nuance to the final piece but is not on display for a third party. Avelluto also has a painstaking and hidden methodology for building objects, but he has a more direct message for the viewer. He reflects on nostalgia and refuses to take an everyday object, even a mere sheet of notebook paper, for granted, treating it as an object for exploration, deconstructing its material and visual elements. Avelluto’s nostalgic concern for information as a concept is juxtaposed with the historical precedents and social awareness resting on Willis’ consciousness. Josh Willis’ painting series, Towers, features monolithic forms confined to small canvases. It is his interpretation of, among other things, the igneous formation of Devils Tower. Each painting’s unabashedly straightforward presence belies the struggle required to bring it to completion. He begins a painting with thick planes of Cezanne-like brushstrokes in vivid colors, only to partially scrape them off, piling on layer after layer in this process until earth tones and energy emerge. Background skyscapes feature contrasting blues that tap into the pieces’ emotional undercurrent with naturalistic clouds or gritty, storm-like impressions. Willis recycles and reinvents his brushsrokes in a stubbornly regimented process until the end result is one from which he might derive a personally relevant lesson or insight. This self-inflicted iconoclasm is a lesson that forces him to reflect on social struggles in the vein of Courbet, or on the concept of communication and message—his Devils Tower depictions are a reference to Bruegel’s biblical Tower of Babel as well as a study in nature’s processes. This series is a testament to art history as well as to personal experiences. John Avelluto’s work appears straightforward, but that is indeed an appearance. Upon close examination, one begins to see it in a very different way as it forces the viewer to ponder reality and philosophy in order to reconfigure its logic and meaning. He uses layers of paint to make objects, (in this exhibition, pieces of notebook paper), blurring the line between painting and sculpture, forcing the attentive viewer to question perception via his products that both reference nineteenth-century trompe l’oeil decoration and update it through insightful critiques of the so-called digital age of information. His repeated representations of paper completely deconstruct the formal elements of the page, and his copies with rearranged lines and holes are, in Avelluto’s words, new “streams of creative energy,” new iterations of an object that is often dismissed as a means of recording mundane data, a part of everyday clutter.10 His meticulous process of layering paint and building up a variety of simulated objects (paper, pencil marks, erasings) from a single material is consumed by the straightforward, representational result. Partly as a result of developing this process, Avelluto stresses the importance of acknowledging and deciphering palimpsests across media as a way of pondering the constant rewriting of information in our society. The cohesiveness of Marksmen and the Palimpsests lies in the ways in which both artists question presentation, form, and representation in a quest to define and utilize process. Process is not the end result, however. Ultimately, in each artist’s series of paintings, one finds a form reminiscent of a familiar object or place, but the significance of that form is that the path leading the artists there was the road less traveled—one of work and loss of work. For the viewer, it is a glimpse into the force and nuance of creativity, of questioning the most basic objects and acknowledging the significance of origin, of research, of context, and of presentation, both revealing and concealing aspects of the artists’ messages. 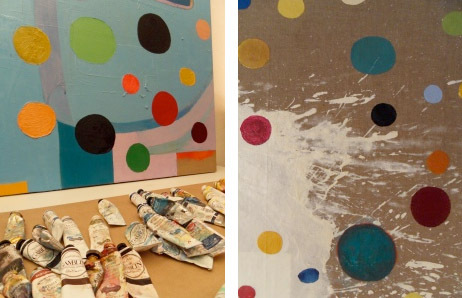 The two artists live and work in close contact with one another. Willis calls this a type of “cross-pollination,” and despite obvious stylistic differences in their work, the artists manifest similarities in terms of meticulous processes and goals. However, Willis also points out that a tangible, physical overlap in the art itself highlights the differences in their work. Therein lies the value of Palimpsests: it is an invitation to both viewer and artist to question and process visual information in all possible ways, to appreciate the inherent cycles of creation, to find new information in the repetition of a familiar object or practice, and to make the creative process a conversation rather than a monologue. 1 Department of Conservation, Maine Geological Survey, “The Seafloor Revealed,” http://www.maine.gov/doc/nrimc/mgs/explore/marine/seafloor/glossary.htm. 2 National Park Service, U. S. Department of the Interior, “Devils Tower,” Geologic Formations, http://www.nps.gov/deto/naturescience/geologicformations.htm. 3 Christopher De Hamel. Medieval Craftsmen: Scribes and Illuminators (London: The British Museum Press, 1992), 39. 4 Marcus Tullius Cicero, De re publica: Selections, ed. James E. G. Zetzel (Cambridge: Cambridge University Press, 1995), 33. 5 Raymond Clemens and Timothy Graham, Introduction to Manuscript Studies (Ithaca, NY: Cornell University Press, 2007), 109. 6 The Vatican Library, “Photographic Laboratory,” http://www.vaticanlibrary.va/home.php?pag=ufficio_fotografico&ling=eng&BC=11#2005. 7 Raymond Clemens and Timothy Graham, Introduction to Manuscript Studies (Ithaca, NY: Cornell University Press, 2007), 109. See also The Walters Art Museum, “The Archimedes Palimpsest Project,” http://www.archimedespalimpsest.org. 8 Frederick Ilchman and Rhona MacBeth, “Tintoretto’s Nativity: More than One Artist, More than One Painting” in Titian, Tintoretto, Veronese: Rivals in Renaissance Venice, ed. Frederich Ilchman (Boston: Museum of Fine Arts, 2009), 164-173. 9 Centre national de la recherche scientifique, Communiqués de presse, Paris, 15 juillet 2010: “Nouvel éclairage sur les visages de Léonard de Vinci,” http://www2.cnrs.fr/presse/communique/1942.htm. 10 Avelluto’s and Willis’ personal comments were recorded during studio visits with both artists in Bay Ridge, Brooklyn, August 2010. 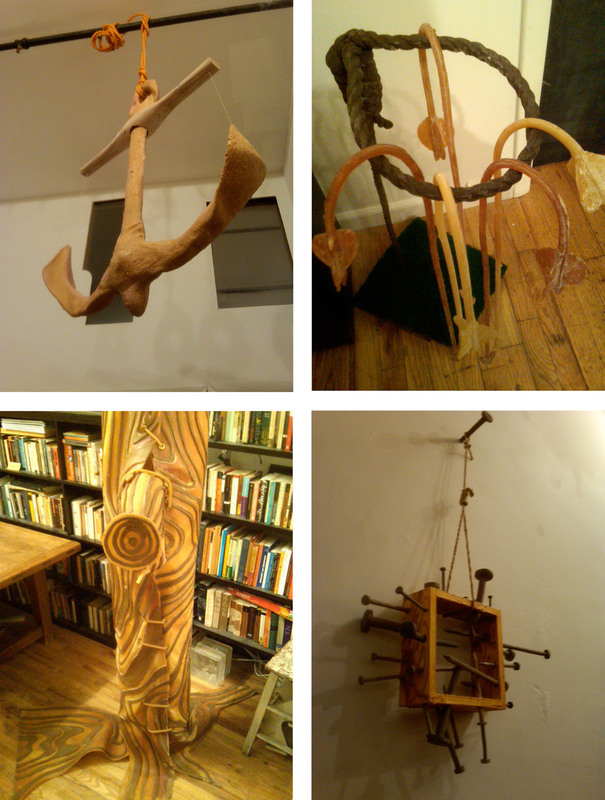 Selected works from Zane Wilson's Portfolio x Appunti at Centotto (clockwise from top left): Untitled (Anchor); Drawing for Ground Quiver; Untitled (Box, Noose, Nails); Untitled (Rubber Tree). 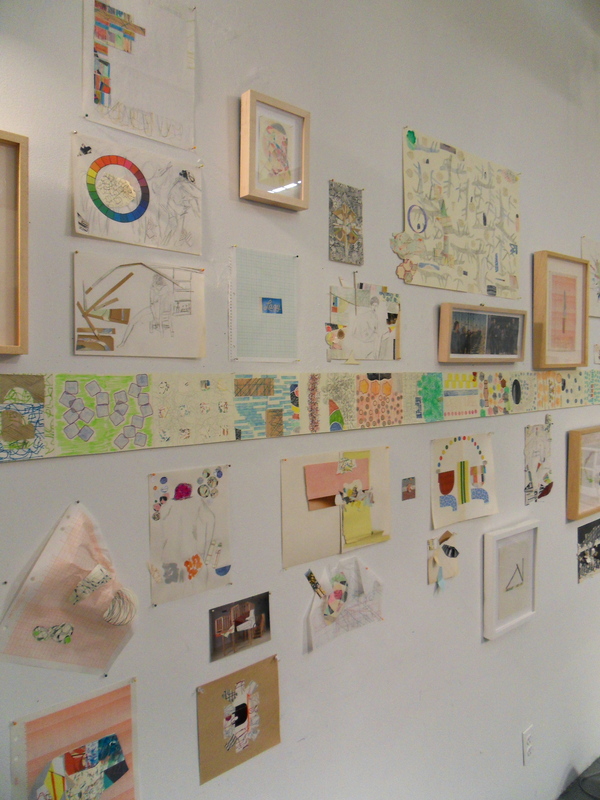 On Friday, January 21, Bushwick’s Centotto gallery, recognized for its curatorial emphasis on dialogue and text, inaugurated a new exhibition format into its rotation. This format, called Portfolio x Appunti, is one in which an artist’s work is “mediated by a five-tiered framework of specific visual and written appunti, or ‘notes.’” Brooklyn artist Zane Wilson is the first to be featured in this configuration. The exhibition formula offers a structure in which the artist can experiment with specific tiers of information on a worksheet: the pieces on exhibit; five lines of text about concepts and contexts; five more on materials and processes; five lists (of inspiration or sources); and five studio shots. In light of the five-themed structure, I offer commentary on five elements of the sculptural exhibition. 1. Tactility. The show’s most striking object, a large wood and latex anchor, has the texture and color of skin. There’s an icky and mesmerizing feel to the latex coating many of the surfaces in the exhibition. More than a few viewers felt an uncontrollable need to touch the art, to interact with it, to see each piece from multiple angles. How many people couldn’t help fondling the tip of that anchor tantalizing them from above? How disconcerting is it to touch what looks like wood grain and feel rubber? This art demands action as much as vision. Everyday objects from tools to fingers are imbued with a lively tangibility. 2. Materials. There are combinations of materials that really shouldn’t really make sense coming together to form cohesive objects. The materials themselves make these objects into more than what they represent. Materials that carry social connotations—wood (life, nature), rubber (protection, sexuality, waterproofness)—make a viewer linger. 3. Objects. The chosen objects carry social connotations, shown in ways that are contrary to their roles in the ‘real’ world. The anchor, a weight, hangs above our heads by a rope, an element that can keep you anchored or pull you to safety. It can also be wound into a noose. A unicorn horn, a symbol of purity (or the loss of it) is made from a drill bit. Is it mounted to the wall or piercing its wooden base? These are not a collection of ‘real’ objects and not mere re-creations. They’re references to objects made with a layer of inherent meaning conveyed via the chosen materials. 4. Playfulness. (And its very sharp edge). There’s liveliness and joviality in a chunky latex saw that couldn’t cut down trees or in arrows that droop over their ground quiver. There’s a chuckle in fingers emerging from records on the wall or in the play on words when you realize Wilson has made a literal rubber tree. 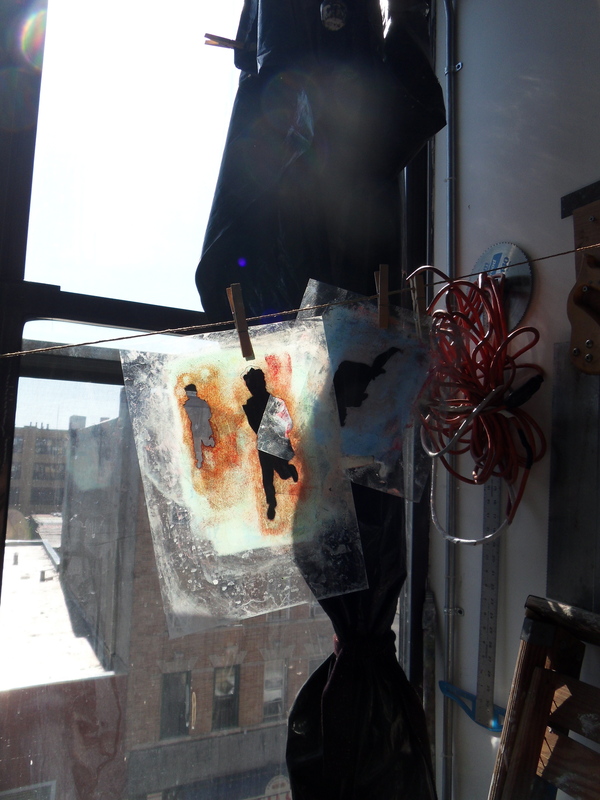 These serve as an unspoken dialogue between artist and viewer. The witticisms have shadows lurking in their corners, however. The vitality of the drill bit horn is crowned with a hot pink noose. The color laughs in the face of morbidity. The floppy arrows are incapacitated weapons. Nearby a hanging faux bois box holds hand-carved nails large enough to crucify or drive a railroad stake, but there’s nothing inside to be pierced. Is the measure of darkness or cheerfulness in these juxtapositions a reflection of the artist or of the viewer? 5. Words. Or lack of them, on the part of the artist. He shares many of his influences and inspirations in the five written appunti. However, he offered very little in terms of interpretative commentary on individual pieces during his artist talk. He lets the work speak for itself, leaving it open-ended. Part of me wants to howl until he explains every object, and the other part delights in filling in those gaps for myself. He gives hints in the titles; a pink rubber hammer for someone “all thumbs in love” plays on words and alludes to human fragility. The objects and their symbolism to the artist are an example of the personal made public, silently reminding us that there’s a soul behind these creations, but we’re only allowed a glimpse at it. Aspects of this show are reminiscent of the artist’s past work—which included images of genitalia or cartoons, for instance—but the references have evolved in their emphasis of the body and nature and manmade objects interacting to convey a sense of humanity throughout the show.